Can you match the design of a memorial card? We can take an existing card as a style guide but we will likely need to substitute in our own images and some other presentation elements may need adapting. If I have my own design can you print it? This is not always the best idea, but we can use your design to guide ours. If you want your own design printed please speak to us before setting it up. Can I have more than one photograph on my design? Yes. We can include as many photos as you wish, space permitting. Can I add my own images to my design? Yes. We can make use of any images you would like to add. There is a one-off fee per image for adapting this to be suitable for printing. Can I add the details of a second person to one card? Yes. Quite often people will add the previously deceased husband or wife to the other side of the inside of a memorial card to symbolise their reunion. Can I order more cards in the future? Yes. We will try to keep your designs on file forever. Extra cards can always be ordered and you will only pay for the new cards plus any delivery costs. Will your logo appear on my chosen image? 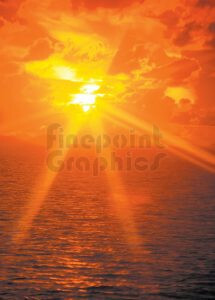 The ‘Finepoint Graphics’ watermarks on our gallery images will not be printed. This is just a security feature on our website. Why are the pages not in order on my Order of Service proof? During the design process the documents are arranged in ‘printer-spreads’. Although the pages are non-consecutive on your proof, they will appear correctly when folded and collated. It may be easier to understand if you print your proof and fold the A4 pages into an A5 booklet. Why does the final print look different to the proof I saw on my screen? A print of a photograph will almost always appear differently to that viewed on a computer or mobile phone screen. Every screen has its own colour settings which we, obviously, can not be aware of. When working on your images we correct the colours to look as natural as possible when printed on our printer, rather than when displayed on a screen. Email proofs can also look different when you print them out on your own printer. Again, this is because all printers will have their own colour settings which we can not be aware of. Can I have a physical proof posted to me? Yes, time permitting. This is often not possible with an Order of Service – or anything else ordered in time for a funeral. However, this is the best way to ensure that the colours presented will be as you expect them to be – there is no entirely accurate way of doing so digitally as we can not know what your screen or printer settings are. We calibrate for the output of our printer. How can I approve my proof? We would prefer if you could give approval by email as we will then have a record of this. If this is difficult you are welcome to provide approval over the phone, by post, or in person. How long does it take to deliver once I have approved? Once approval has been received it will usually take us 1 to 2 working days to produce and dispatch your order. Please see the Ordering & Delivery page for delivery times.